Like new rarely used. Vacuums up leaves and turns to mulch, also shreds sticks and branches. 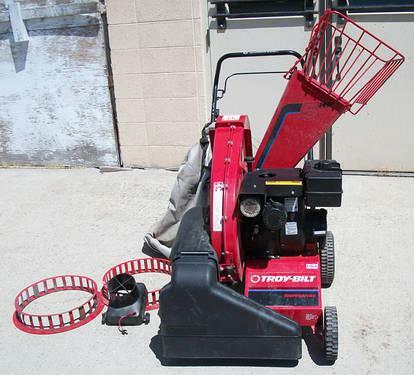 I have for sale a Troy Bilt Chipper for sale. I picked it up used and it does not look like it has been used much. I have no need for it. I would like to get $400.00 or best offer. So give me a call or text if interested. This is a Troy-Bilt gas powered lawn vacuum and wood chipper. Used, but work great! Was over $500 when new. $375, or best offer. Cash only. No checks. Call or text. No emails. Local pickup only. I will not deliver.